Seriously. I guess I got a little carried away for a while making them. I was very creative with frittatas, but still, I guess at least one of my daughters wasn’t fooled. I also remember thinking how funny her request was at the same time. I mean, it’s like a kid asking the mom to quit serving foie gras or oysters on the half shell. Which is exactly why I remember her question to me so vividly. And yet, I must have overdone it. And I think I know why. I’d always made omelets and the like for my kiddos because I was passionate about preparing breakfast for them, even though it involved getting up earlier than most other moms. It was worth it to me. 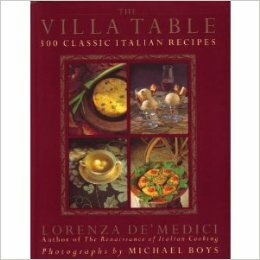 But then I was introduced to this cookbook – The Villa Table, by Lorenza de Medici – and I was smitten. Blog-wise, I’ve made stuffed zucchini based on Ms. Medici’s recipe, but it’s so full of wonderful recipes, that if you didn’t love Tuscan food already, this book will put you over the top. In any case, in the book Ms. Medici has a recipe for a frittata, to which she adds leftover spaghetti. Seriously! And I mean, why not? You can really put just about anything in an omelet or a frittata, so why not leftovers like a pasta dish! I had so much respect for her for including such a mundane, yet perfectly practical recipe, or idea, if you will, that I think I got a little crazy then, throwing just about everything left over from the previous night’s dinner into the next morning frittatas for my girls. That is, until I was asked to stop. When I wrote up my omelet post a while back, I realized I hadn’t made a frittata in years, thanks to that daughter. And I was really kicking myself. When I have some folks visiting, it’s the perfect thing to make in the morning, but I had completely blocked it out! You see, an omelet is best made one at a time as a single omelet for one person. But the best thing about a frittata? A large one can be easily made and it can be sliced up to serve many! There’s nothing mysterious to a frittata. It contains the same ingredients as an omelet, primarily beaten eggs, of course, cheese, and often accessory ingredients as well. These can include something as simple as asparagus, or as involved as leftover pasta bolognese, like I mentioned above. 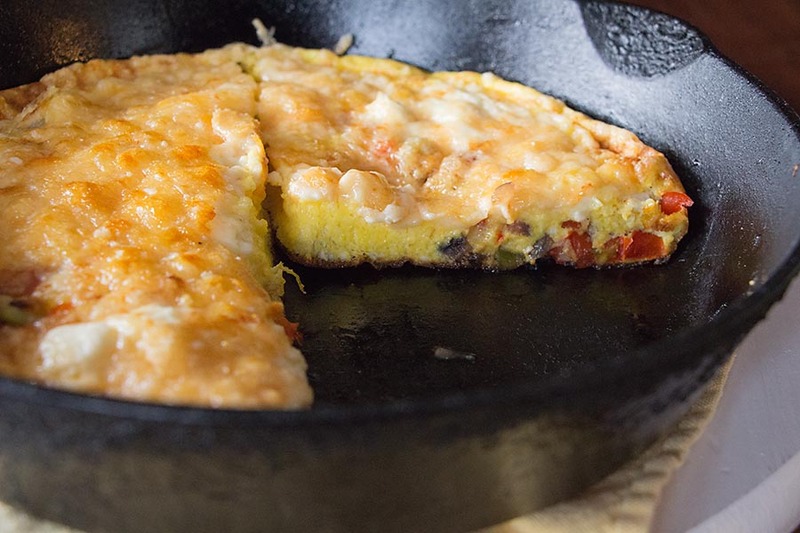 A frittata is essentially an open-faced omelet – made in the same way as an omelet, except the last step is to place the cheese-topped omelet in the oven for some browning. 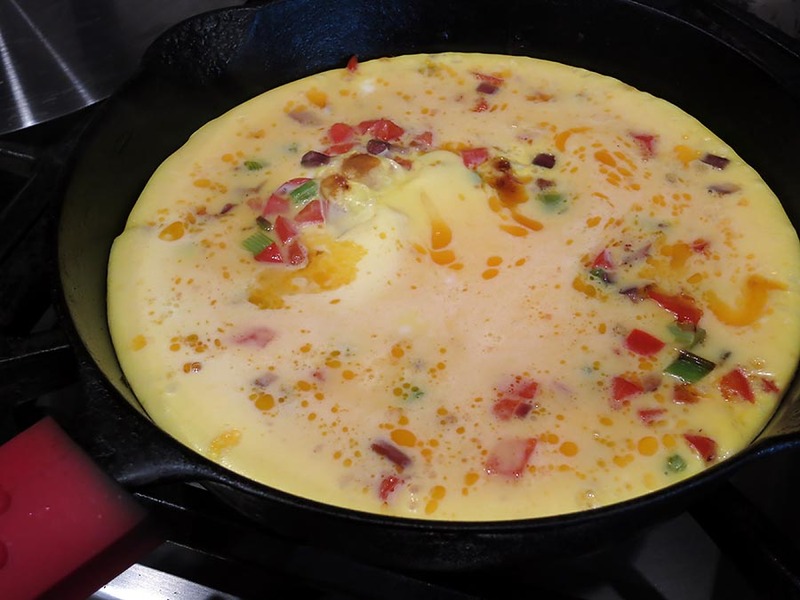 You do have to take some care with the frittata, however, just like an omelet, to not overcook it. Otherwise, it would be a big rubbery awful mess. 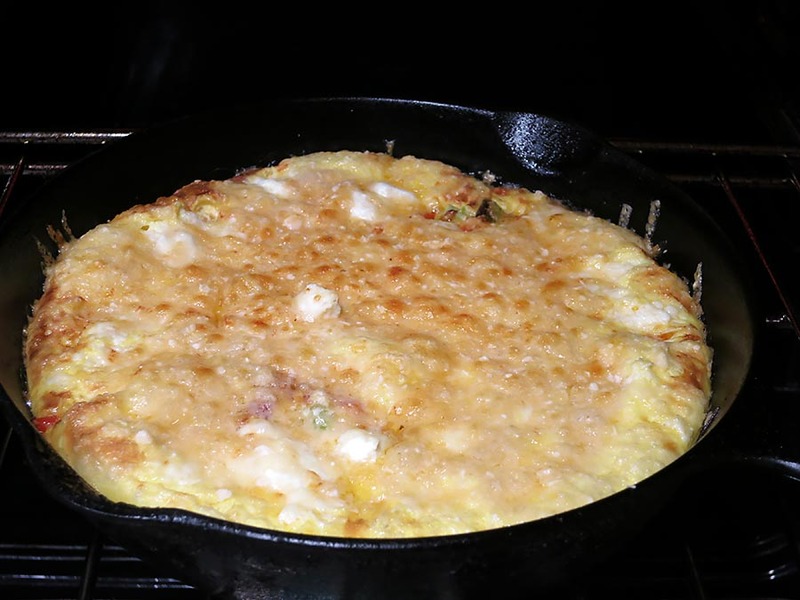 So I’m going to offer up my version of a basic cheese frittata. What else you do to yours is completely up to you. Trust me, once you start adding your leftover pastas or stews or vegetables to yours, you’re going to be making them quite often, just like I used to! 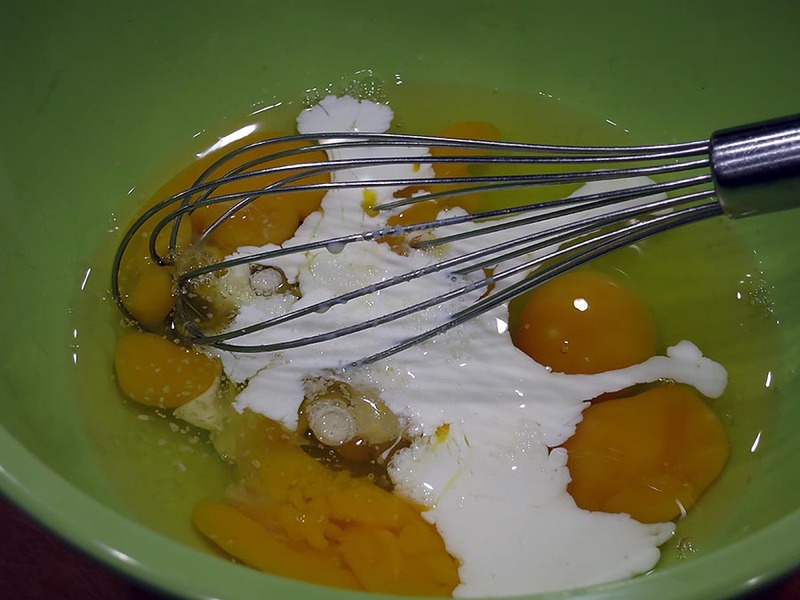 Place the eggs in a medium bowl and whisk them well with the cream and salt. My eggs were close to room temperature, but this isn’t necessary. Set aside. 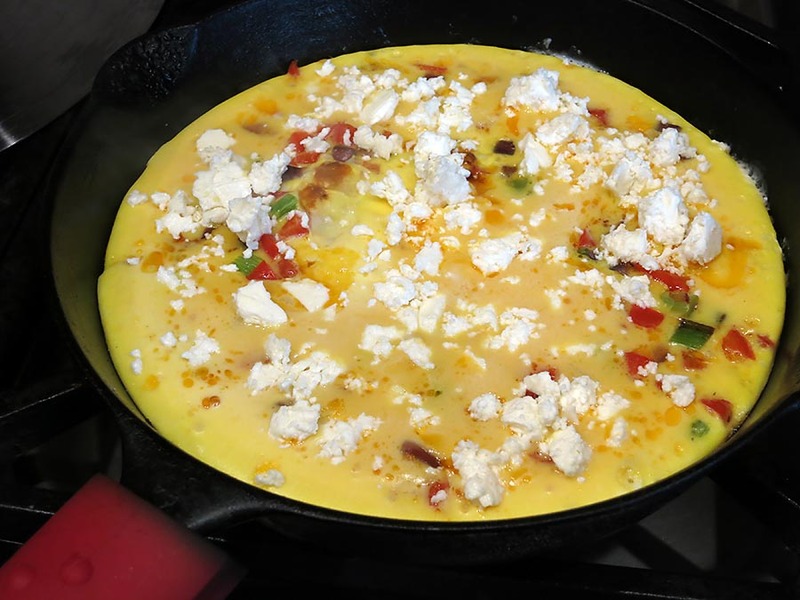 In the skillet in which you will be making your frittata, which much be able to withstand broiler temperatures, heat up the butter over medium heat. 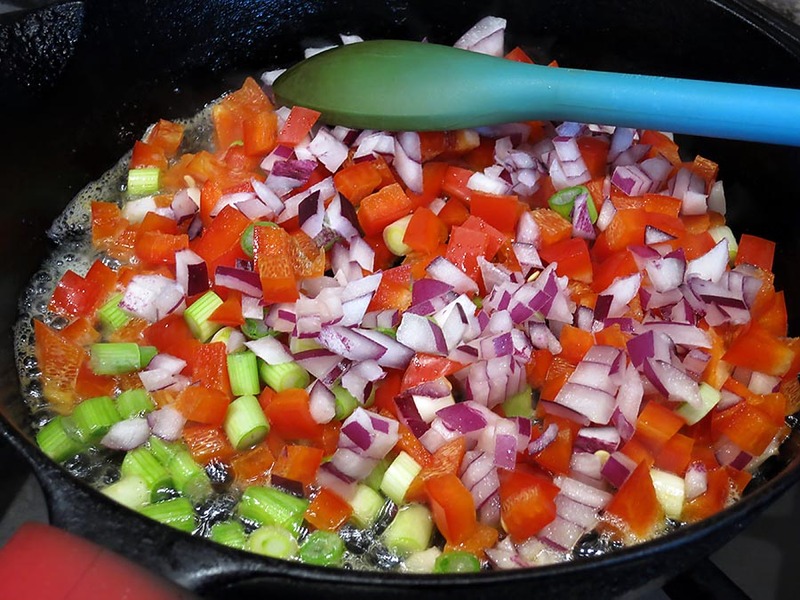 Add the red bell pepper, green onion, and purple onion. 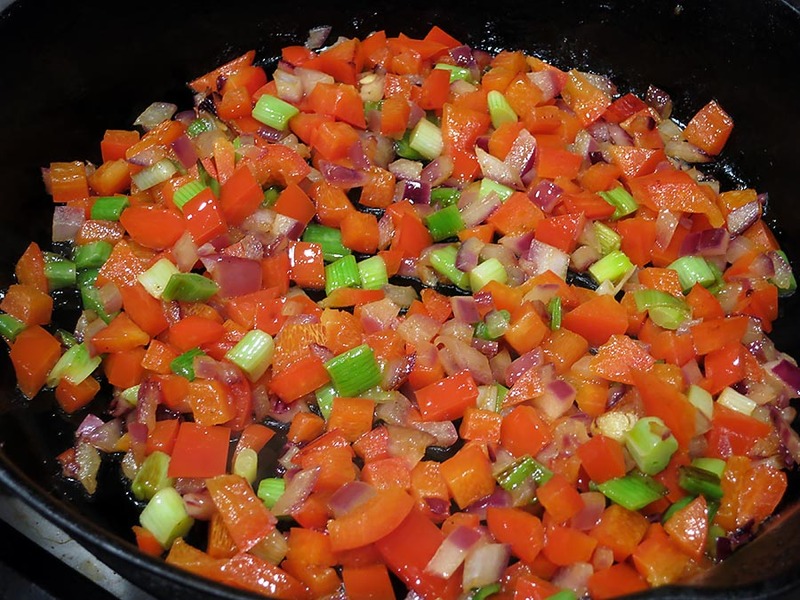 Sauté the vegetables for about 5 minutes, or until soft. At this point, turn on your broiler, and have your shelf on the top of your oven, directly underneath the broiler. Pour the whisked eggs into the skillet over the vegetables. Make sure the hear is at its lowest point. Just like with making an omelet, this process will take some time. Place a lid on the skillet. After about 4-5 minutes, you’ll see that the eggs are starting to cook. I added some leftover goat cheese that I happened to discover. Now, this isn’t in the recipe, but I wanted to show how many different things you can do with a frittata. 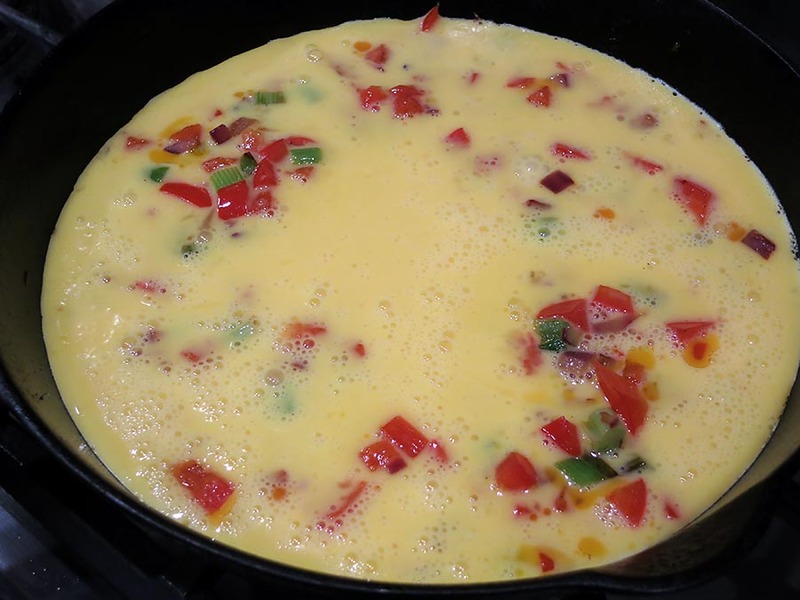 Before you add the cheese, make sure that the frittata is about 75% cooked; there will still be liquid in the skillet at this point. Then I covered the goat cheese with the generous amount of Parmesan. I was in a cheesy mood that day. Place the skillet under the broiler. After a minute or two it will look like this, and there will be no liquid left in the skillet. I cut this frittata into four wedges, which seems like quite generous servings, but there are only 6 eggs in the whole frittata. You can remove the frittata easily from the skillet if you wish, but I just served them from the skillet. 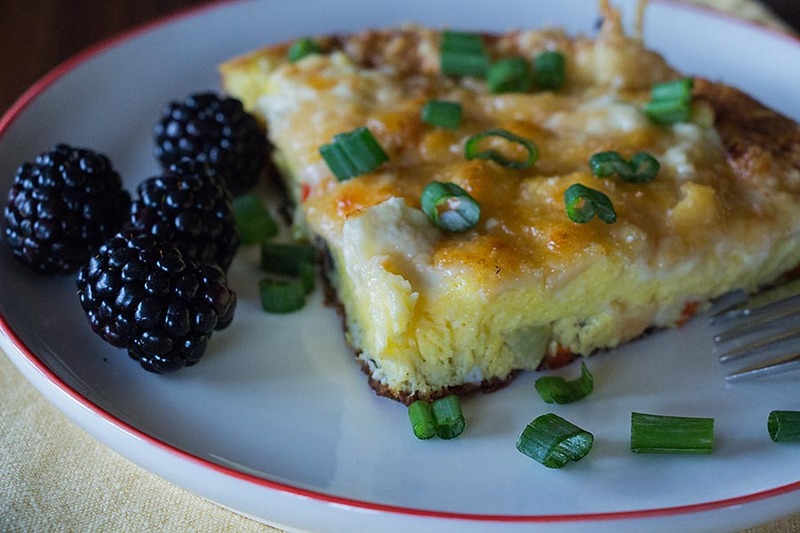 Frittatas are fabulous for both breakfast and brunch. I’ve also seen in another Lorenza de Medici cookbook that sometimes a wedge of frittata is served between two slices of bread for lunch! Personally I will take my frittata without bread. But now you get an idea of how many different things can be used in a frittata. I could have sautéed any vegetables and aromatics. Spinach and mushrooms can be used as well, but I would prepare both of them much earlier, and drain them of excess liquid. No one wants a watery frittata. And I could have used 8-10 eggs in the same skillet for a much thicker frittata, which of course would take a little more cooking time. It’s just what you want in the end. 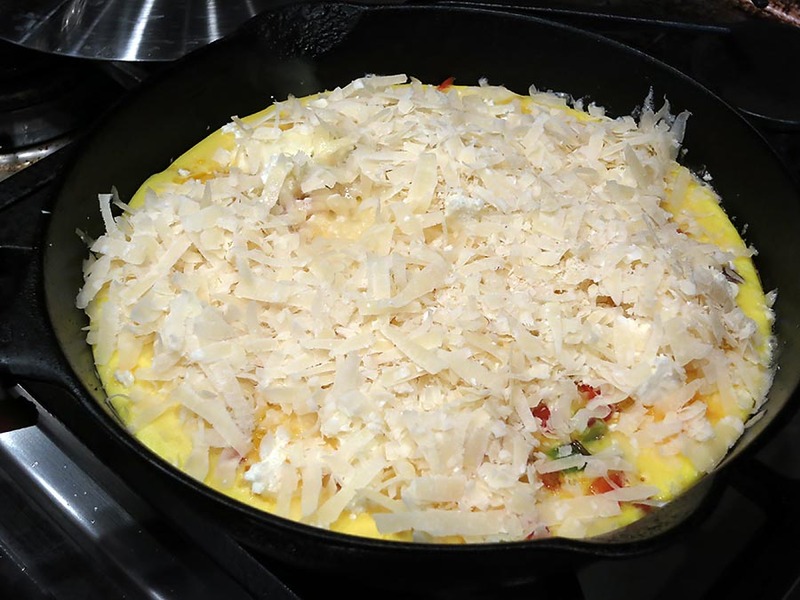 But the key is to cook the eggs slowly, then let them finish off in the oven while the broiler is taking care of melting and browning the cheese. It’s a lovely egg dish! It’s so easy to do it that way, plus lots of skillets can’t handle being right under the broiler! I love frittata. It’s been ages since I’ve made one so your post is a timely reminder! Love the fact that you’ve crowned yours with a mound of cheese. I am exactly the same, I love cheesy, eggy goodness like this. Yum! Why not! Eggs and lots of cheese – the best! I know! That’s why I had such a respect for Ms. de Medici. It’s not a hoity toity cookbook! I have some left over sausage pasta sauce from last night – you have inspired me to make a frittata with it! Thanks Mimi! I – like you – had a little frittata frenzy, about a year ago, basing them around Hugh Fearnley-Whittingstall’s recipe for a summer veg and goat’s cheese one. I totally agree how lovely they are and how straightforward, and there’s so much room for so much variety. The cheese on top of yours is SOOO tempting! Frittata! in italian we use that word whenever you want give the impression of having mixed a lot of stuff together (not only with food)! your frittata has to be delicious! Now that looks like a frittata that I could love. I know what you mean about overdoing some meals. When I had some medical problems years ago, my husband graciously took over the cooking but he was pretty much a 3 recipe kind of guy. To this day all you have to say is “tortellini soup” and my daughter & I kind of groan. That sounds like a great cookbook – I’ll have to check it out. That’s a funny story! Do look into the cookbook. She’s quite the expert on Tuscan cuisine! My friends call me the frittata queen. I absolutely loathe waste, leftovers make incredibly delish frittata and if you don’t reveal it’s made with leftovers, guests will be left thinking you’re incredibly creative!! I deliberately choose pans that can go from the stovetop to the oven, or under the grill to make life simple. Hahaha! That’s funny! I back to being queen myself. It feels good! We love frittatas but, then again, we just plain love good food. A few weeks back I made a frittata recipe that popped up in my morning batch of news soundbites from Bing. It caught my eye because it added flour to the frittata which gave it a much firmer texture thanusual. Curious if you have ever encountered that in your culinary adventures. The jury is still out in our house if the addition of flour is a good thing or not. Hmmm. I can say I’ve never come across it. How did it change the texture? This is very interesting! I would describe it more like the filling for a quiche without the crust. The nice thing about it is it cuts into pieces well if you wanted to use it as an appetizer and it also freezes well. But to my mind, it makes it taste less like an omelette and more like a savory finger food. 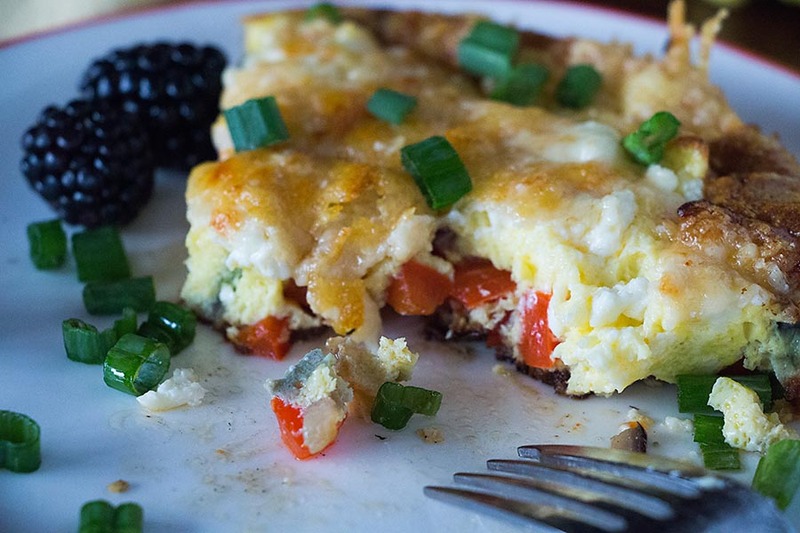 Your frittata looks wonderful, they are so delicious, love to make them. Your step by step photo’s are great. I can attest that leftover frittata does make a delicious sandwich. Oh, I believe it. It’s just that I would gain ten pounds just looking at that sandwich. Sadly. 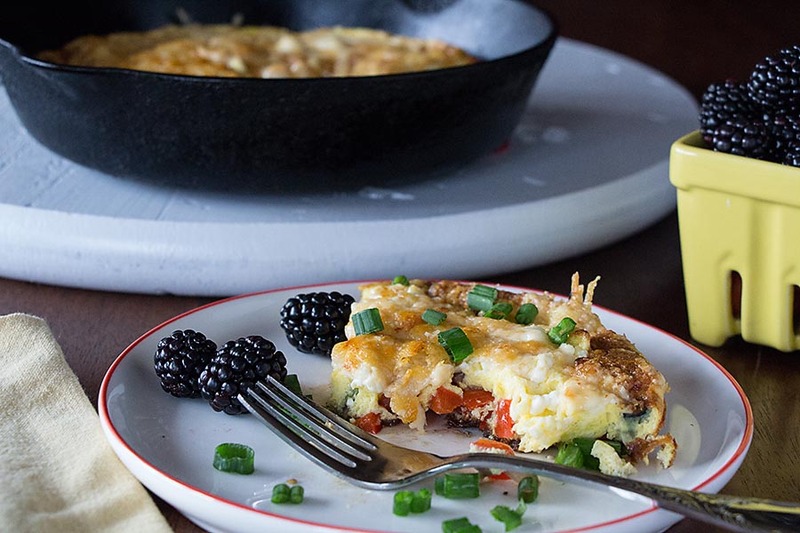 I’ve never thought of adding pasta to frittata, but you are right, it’s such a practical idea! I might also start going overboard with frittata, haha! It is practical, and it’s delicious! I love fritattas! Can’t get enough! Hi Mimi, your pictures look better and better :-) Have you taken classes? No, Charlotte, but thank you. I’m trying to be more patient. I love photography, but I have to plan more and take my time, which is hard for me!